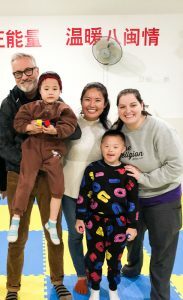 Our therapy and leadership team made a special trip to see Richard (Xie Minyu), Ed (You Kang), Brody (Hu Minpeng), Graham (Xie Minfa), Seth (Long Wang) and Grady (Hou Tong) in their new homes in Fuzhou, Fujian province. In addition to bringing a new ankle/foot brace for Richard, we also brought some gifts for each of the boys, and provided therapy training for the staff at the children’s welfare home. We were able to tour and observe the vocational classes at their adult welfare home as well. Richard and Ed are doing very well and attend public school every day from 7:00 am to 5:00 pm. Because he is in school all day, Richard doesn’t currently attend therapy; however, it was recommended to the orphanage staff that he resume receiving therapy if possible. Both boys are currently living in foster families with four or five other children on the campus of the children’s welfare home. Our team fitted Richard with a new ankle/foot brace that helps him walk and run better. We were also able to buy him new shoes that fit the brace properly. Brody and Graham live in the same bedroom at the children’s home and both boys receive therapy three days each week. Graham is receiving speech and ABA therapy, while Brody is receiving speech therapy. Sadly, there is no special education for these boys at this time; however, there are volunteers from the university that come twice a week and host six hours of preschool and kindergarten classes each week. Both Brody and Graham attend these classes. Brody still uses the American Sign Language he learned as an alternate form of communication. He also remembers all the signs and words to the song “Twinkle, Twinkle, Little Star,” which he learned while living at SFCV. Graham was given more chewy tubes, which help provide him the oral motor stimuli that he seeks. We were also able to train his caregivers on how to use a sticker chart and a “First-Then” board to help keep him focused and engaged in activities. Our team also trained Graham’s caregivers on how to maintain his hearing aid. Grady and Seth are living at the adult welfare home with seventy other young men and women. Grady lives in an apartment with five other men. He and his roommate get along very well, and his roommate is very eager and willing to help Grady with transfers and chores. Seth lives in a bedroom with five other young men. They are all very happy and attend recreational activities daily. Our team toured the vocational training school on the campus of the adult home, where they provide classes in life-skills, arts and crafts, and cooking. They also train individuals to work in nail salons, and coffee shops—both of which they have on their campus. The home also has gardens and a small farm where they grow crops to sell at local farmer’s markets. Our team was very inspired and impressed with the love, care, facilities and programs at the adult welfare home in Fuzhou. We are delighted to report that all six of our boys currently living in Fuzhou are doing well and are receiving excellent care!